You Can’t Go Wrong With Nana’s Salmon Patties! I love burgers. American burgers are the best burgers in the world; the biggest ones too. They’re juicy and so flavorful. I have been to a few countries and their burgers tasted good, but they were only half the size of American burgers. I have always thought that Americans take their burgers seriously. Fish burgers are not new to me. In fact, I always order fish fillet burger from my favorite fast food restaurants. But I hadn’t heard of salmon patty burgers. So when I heard my sister-in-law talking about making delicious salmon patties, I couldn’t wait to try give her recipe a try. Good golly, these are the most delicious patties I have ever tried! 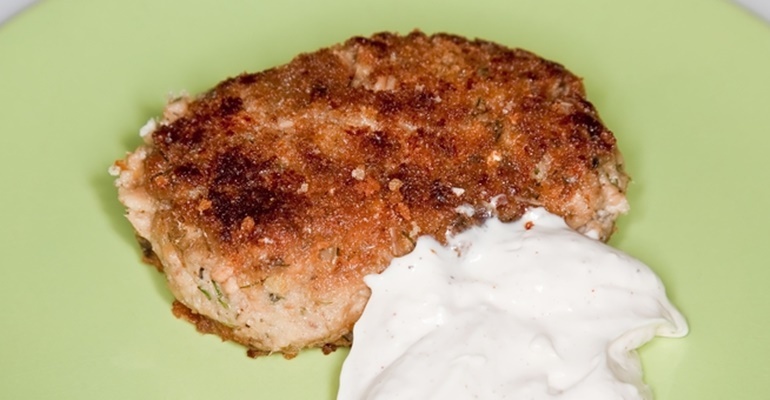 I’ve made fish burgers with these salmon patties many times already, and they’ve always been a great success! Of course, you could also serve these with mashed potatoes! Did you know that you can freeze these patties and enjoy them at a later time? I like to make a double batch and pop half into the freezer. Just take them out of the freezer and allow to thaw before cooking. It really is that simple! Quick Tip: Serve as burgers or with mashed potatoes.